Today in Masonic History Theodor Reuss is born in 1855. Theodor Reuss was an Anglo-German occultist and head of Ordo Templi Orientis. Reuss was born on June 28th 1855, in Augsburg, Germany. In his youth he was a professional singer. He later became a correspondent. In his job as a correspondent he traveled frequently to England. It was during one of his trips to England that he became a Freemason. In 1880 in Munich, Reuss attempted to revive Adam Weishaupt's Bavarian Order of Illuminati. During that time on a trip to England he met with William Wynn Westcott, the Supreme Magnus of the Societas Rosicruciana in Anglia and one of the founders of the Hermetic Order of the Golden Dawn. In 1885, Reuss joined the Socialist League, an early socialist organization in England. In 1886 he was accused of being a police spy and was expelled from the organization. This was not uncommon, paranoia ran high in the organization and many people were accused of being a police spy, often with little or no proof. In 1888, Reuss again tried to revive the Illuminati with little success. In 1895, Reuss began to discuss the formation of the Ordo Templi Orientis (O.T.O.). It would not be until 1902 that Reuss with the assistance of Carl Kellner would form the order. 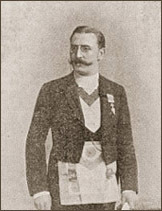 In July of 1901, Westcott gave Reuss a charter for Swedenborgian Rite of Masonry, which actually is not directly associated with Freemasonry, it was an order that was patterned after Freemasonry. Reuss also received authorization to create a High Council in Germania of the Societas Rosicruciana in Anglia. Around 1902, Reuss along with others activated the Masonic Rites of Memphis and Mizraim in Germany. They also established a branch of Scottish Rite, Cenau Scottish Rite, and Reuss was named a 33 of the order. This gave Reuss and his colleagues the ability to run a Soverign Sanctuary 33 - 95 of the Scottish Rite, Memphis and Mizraim rites. While living in London, Reuss met and became friends with Aleister Crowley. In 1910, Reuss made Crowley a VII of the O.T.O. In 1912, conferred upon him the IX and appointed him National Grand Master Gerneral X for the O.T.O. in the United Kingdom of Great Britain and Ireland. This also gave Crowley control of the lower masonic degrees of the O.T.O. which was called the Mysteria Mystia Maxima or M∴M∴M∴. Crowley also wrote a Gnostic Masss for Reuss's Gnostic Catholic Church (G.C.C.). When World War I began, Reuss returned to Germany. There he continued to work on elements of the O.T.O. and the G.C.C. He translated Crowley's mass in German and delivered it a the first meeting of the Anational Congress of the Order. It is believed that sometime around 1920, Ruess suffered a stroke, although this was never proven. The idea is based on a letter from Crowley that does not mention Reuss by name but does seem to be referring to him. Crowley took the opportunity to force Reuss out as the Outer Head of the Order (O.H.O) of O.T.O. Ruess passed away on October 28th, 1923. Ruess was a member of Pilger Loge No.238.